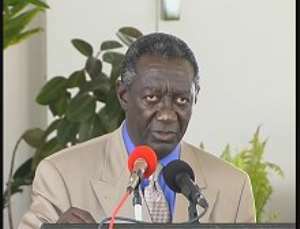 Accra, May 25, GNA - President John Agyekum Kufuor on Tuesday pledged the Government's commitment to the ideals of the African Union (AU), saying it and would spare no effort to promote peace and stability within the borders of Ghana, the West African Sub-Region and the Continent. "Furthermore, the Government will continue to engage the citizenry in the economic and social transformation process of the country and ensure equitable distribution of all gains", he said. President Kufuor made the pledge in a message read on his behalf by Mr Hackman Owusu-Agyemang, Minister of the Interior at a reception held at the Banquet Hall in Accra to climax activities marking African Day. On display were various dishes and beverages from some African countries. Countries including Ghana, Guinea, Liberia, Libya, Morocco, Nigeria, Sierra Leone, Cote D'Ivoire, South Africa, Togo, Zimbabwe, Algeria, Benin, Burkina Faso, Ethiopia and Egypt. The Ghana Police Service Central Band provided melodious tunes to the audience that included members of the Diplomatic Corps, Parliamentarians, Politicians, Members of the Council of State and Chiefs. This year's celebration of Africa Day marked the 41st anniversary of the founding of the Organisation of African Unity (OAU), which was transformed into the African Union (AU) in July 2002. The 36th Ordinary Session of the Heads of State and Government of the AU held in Lome, Togo in July 2002, declared May 25 each year as "Africa Day" a work-free day in all Member States. It was a Day set aside for Africans to remember the Founding Fathers of the Organisation, their tremendous struggle and sacrifices, which brought freedom to many countries and proclaimed the dignity of the African. The day also marked the beginning of the quest for unity and solidarity on the continent as well as the economic emancipation of the people. President Kufuor, who is also the Chairman of the Economic Community of West African States (ECOWAS), said most importantly the Government and the entire citizenry were currently committed to the democratic process. "I have no doubt that Ghana will succeed in its match to prosperity as was envisaged by the Founding Fathers", he added. President Kufuor said the colourful flags of the various African countries paid glowing tribute to the success of their political aim, unfortunately, however, in many parts of Africa the economic and social gains of independence were still far from full realisation. He said Africa was still home to the greatest number of least developed countries and people living below the poverty threshold. President Kufuor said Africa boasts of only one per cent of the global Gross Domestic Product and about two per cent of world trade figures, which represented a regression compared to the 1960's. "Indeed at the dawn of the 21st century, Africa's image is that of a continent which is yet to position itself to take advantage of the economic globalisation that is already creating tremendous opportunities for wealth creation in the developed countries", he said. President Kufuor said fortunately, these handicaps had rekindled a new sense of mission in the current crop of African leaders to awaken their people who were now determined to co-operate under the auspices of the AU with its New Partnership for Africa's Development (NEPAD) Initiative to put the Continent on the mainstream of globalisation. Mr Amon Tanoe, Dean of the African Diplomatic Corps, lauded the untiring efforts of President Kufuor in promoting peace and stability on the continent, saying his capabilities transcended the frontiers of Ghana. He said what Africa needed most at this crucial time in her quest for sustainable development was an honest and judicious use of its resources by the leaders for the economic and social well-being of its citizens. It was in this direction, Mr Tanoe said, that the continent's leaders instituted the African Day celebration to elicit people's recognition and understanding of the new challenges confronting its march to accelerated development and ensure economic emancipation. The day was also to highlight and appreciate the wisdom of the founding fathers of the Organisation of African Unity about 41 years ago to consolidate the independence and sovereignty of the various countries on the continent. The OAU is now the African Union. He said leaders could draw valuable lessons from the achievement and failures of the OAU to advance the course of the Africa Union. Guests at the banquet had a treat to variety of dishes, especially prepared by the various African diplomatic missions in Ghana.